"All of my records are boxed away," confesses Field Music's David Brewis, "because I thought we were going to move before Christmas and we haven't We still haven't moved. I'd really like to get that frustration out of the way. [sighs] I just thought about it again and got stressed. I feel like I have modest goals. We've made the record, there's very little we can do about it now. It's really nice if people like it, now what we can do is the shows and do them really well and sing really well and have a good time. I was introduced to Field Music by my college radio show co-host. I was particularly taken by "Them That Do Nothing", a track that spoke to my then-impending graduation from college. I found the pop created by Field Music to be reminiscent of many of the bands I love. Talking with Brewis, you get a real sense that he is a kindred spirit in music geekery, he commands an impressive knowledge of pop music and an infectious enthusiasm, to the point where you want to rush to your parents turntable and pull out the LPs they used to spin when they were your age. I spoke with David earlier this year prior to the release of Field Music's newest album, Commontime (their sixth overall), and our conversation covered a wide-range of topics: from touring with his brother Peter, the influence of his parents' record collection on him, and the job struggles facing this generation. It was an enlightening conversation full of laughter and interesting discussions. Brewis is a thoughtful and full of clever turns of phrase, it's easy to see those qualities shine through in his lyrics. Brewis is the sort of person you strike up a friendship with while browsing the racks at your local record store. So let's browse, shall we? What most excites you about this new album? I haven't listened to it for a while but when I listen to it, I find myself laughing about some of the backing vocals partly because I remember me and Peter in the studio having a good time doing the backing vocals and partly I think "That was kind of an audacious thing to do." The backing vocals are all really quite prominent and quite complicated. Kind of fun, like pop complicated. Hearing the backing vocals cheers me up. Then as we've been kind of getting better at doing them in rehearsals, the idea that we're going to do these really complicated backing vocals live is another thing which is keeping me on my toes in a nice way. Is this a new approach to backing vocals? Have you tried something this complicated on prior records? We always inclined to do pretty complicated backing vocals. It's been a thing we've always done. We've always done backing vocals. This thing of backing vocals this way is the one thing that we do which ... certainly no else just making, I hate using the phrase but, indie rock does. You know you have bands they'll all shout in the chorus together or like one person in the band occasionally does a harmony in the chorus. But to have it so up front, it feels like something where we're kind of good at that no one else is good at but maybe this time we should really embrace it. I think that makes a lot of sense, there's not a lot of bands on the radio that sound a lot like you. To my ears and I think a lot people feel this way, there's kind of an strong XTC influence on your sound. Would you agree with that assessment? I mean, they're not an influence. I've hardly heard any of their records. I like the first one and I like a couple of the singles but I think the first one isn't particularly like what people think of as the XTC sound. Everything's really fast on the first album and kind of hectic. But I think the things took from are probably similar to what we take from. We're obviously big Beatles fans. We're big Todd Rundgren fans. Steve Lillywhite produced Drums and Wires, which sonically would be the XTC album that I'm most inclined to check out. Peter's got it, I don't have it but I know that "Making Plans for Nigel" was on that one. Steve Lillywhite also produced other records that we really like, like Peter Gabriel's third album. That's a big one for us. So with XTC, I can see how we get aligned with them but as an influence, for me, absolutely not. It's interesting that you brought up Drums and Wires because that's kind of the record that reminds me of Field Music, especially, "Making Plans For Nigel", that almost has like a Captain Beefheart drum part. Yeah, the drummer was great. I've seen some clips of him recording, if it wasn't that album, maybe Black Sea something around that, like turn of the '80s. The drummer's great and he plays these quite odd things but with a groove. I think that's something we've always tried to do. Let's not do drummers cliches, but whatever you play, it's gotta have the right momentum. For us, that comes as much from Led Zeppelin. John Bonham played all sorts of quite odd drum beats, but he made it feel so natural and so like what a proper musician would play. As a layperson, as not a drummer, I don't think you would listen to that and think "Oh, what funny time signatures they play!" you'd just think, "Great rock band!" I think that's probably more what we aspire to. You mentioned Todd Rundgren, what era of Todd's career would you say is the biggest influence on you guys? A Wizard, a True Star for sure. There are other records of his that I like and other songs, but across the career that I really like. But everything really that I like about him is encapsulated in that one, crazy record. We actually saw him play it live maybe five years ago. Did the whole thing, in London, it was like a big family trip down to see Todd Rundgren. He had costume changes and he had the band all up on columns spread around the stage. That's up there with the top few shows I've ever seen, along with Prince in London as well, when he did 31 nights. The night I was at was full of hits, that might have be the best of all, sorry Todd! I met Todd a few years ago when I was an undergrad at Indiana University, he was a guest professor the fall semester of my senior year. I was the grading assistant for the this professor who teaches rock history classes. He knew Todd and I got to meet him. I was wearing a Tom Baker scarf, so he complimented me on it and told me he used to knit. He played a recital in one of the music school halls and conducted the marching band playing "Bang On The Drum". That kind of thing never happens at our lovely universities. You know, Bryan Ferry studied fine art at the university I went to. I never saw Bryan Ferry come in and lecture on either art or music, which is a shame. Related to Bryan Ferry, one thing I've noticed in some pieces following the death of David Bowie and Alan Rickman, Billy Bragg mentioned it how those guys came from working class backgrounds but were given the opportunity to study at art school. You mentioned going to art school, what kind of impact did that have on your music? I didn't study anything artistic at all, I studied maths. "What impact kind of impact did that have on your music?" I don't know, the biggest impact on our music career in a way is our parents, they were of the same generation as Bryan Ferry and Dave Stewart (who was from Sunderland as well) from the Eurythmics. This wasn't great for everyone, but basically they were smart kids from very, very poor backgrounds who got to study further education for free. It's like a blip in British history, where working class kid were allowed to go and study, there were grants available if you wanted to go to university. So that opened it up for my parents and then for like my generation, to have this unusual confluence of kind of educational aspiration and not to be totally struggling for money all the time like they did when they were young and their parents did, you know work all the hours and still lived in the poorest areas, didn't have spare cash. The thought of it is just bizarre. We've benefitted from those freedoms. It changed with my and Peter's generation where for a brief period, it was just expected and Tony Blair, the prime minister, wanted half of all kids to go to university. Which meant a rapid growth in higher education at the expense of it meaning so much, I think. So we got to go to university and take it for granted. Now there are just tens of thousands of kids my age (kids! I'm 35) who don't use their university education at all. They have a degree and in some cases have master's degrees and work in call centers or work in shops. It's probably the same in the States. Well-qualified, but this promise of of a higher-skilled economy hasn't come along. So there's a kind of confusion amongst our generation. What are we supposed to do now? We look back to our parents and think "You had it so hard, but it kind of worked." And now we feel like we should have lots of choices and don't. It's a very roundabout way of answering your question. I went to university thinking, "At some point I'm going to have to get a real job and a real degree." I think you hit it right on the head, I studied musicology in grad school and I'm not using that. I have a bachelor's in journalism and I use that mostly in freelance work. I'm currently a beer purchaser at a gourmet market. One of your songs that sticks out to me, I believe it was on Measure, "Them That Do Nothing", I think that really hits the nail on the head. We did what we were supposed to do and now we're working service industry jobs. You get to the end of that and you think, "Well, I'll keep going. I'll still do what I love in my free time and if it ever tuns into a job, great." I think there are hints of that in so many songs on our records. I think that Peter writes about it more explicitly than I do. But it's certainly something in the air for our generation. I think of my friends, so many of whom went through some kind of crazy crisis in their mid-to-late 20s, which seemed to stem from, "Well, what do I do now?" It's changing into a different kind of crisis for me and Peter now, because we're married, we've got a place to live and we've got kids. I'm going to get jumped on by my cat very soon. We've moved on to a kind of domesticity and now it's more about the balance between that and somehow managing to sustain this bizarre career we have. What the effects of that been on your music career? How has it influenced your songwriting? I mean a big thing this time around has just been about condensing our time. We have less time in the studio, we have less time to just ponder things. I've always felt that was an integral part of my songwriting process to have an idea and just think about it for a few weeks. Now that's a luxury we really don't have. It's meant that when we go into the studio it's kind of feverish. "I've got this thing, let's do something with this thing!" "But I'm not finished yet!" "But we'll make something with it." That has never really happened to us before. It's definitely affected what we write about, but for me not so much. There's only one song on mine on the new album about having a baby. Where as Peter, there are allusions to it through a few more of Peter's songs. What kind of effect has this had on your touring? Our UK tours are a pure dad tour: Thursday, Friday, Saturday for four weeks. I've never been a great tourer anyway, I've never been desperate to be away from home for months of time. I find it quite difficult. I find it quite difficult there being so many things I have no control over. The US tour for us, it's very short at our request actually, we don't want to away from the kids for that long. But I know we both find it incredibly difficult. One of the good things about being a musician-dad is that I can change my time around so that I can take an equal share looking after our little boy. So I've spent an awful lot of time with him. We're best mates, my 20 month old and I. So I'm going to find it really difficult to be away. I think I'll find it more difficult than he will. I think he'll get used to it after two or three days and let my wife sleep. I don't want to be away from him. I can't think of a touring scenario where I could bring him with us. Maybe if we had tour managers and huge tour buses and were staying in luxury, then maybe but as it is, not really. It's going to be really difficult. You mentioned your parents being a big influence on you and you obviously play in a band with your brother. How else does that family connection impact your approach to making music? Whether we realized it or not early on, their record collection is the basis of what we do. Their support while we were starting out, a long time ago allowed us to get better, to get good. We started out playing covers in pubs when I was still at school, when I was about 14. They weren't very strict about how old you had to be to get into pubs in those days, I think it's gotten a little bit stricter. Not as strict as it is in the States! Obviously, we couldn't drive then so us playing in pubs became my mom and dad's social life, so they would drive us there. They would load the Hammond organ up in the back of the estate car. They'd ask their friends if they knew anyone who had a PA we could borrow until we saved up enough for our own. But I've certainly never felt that generational divide. I don't want to make music to piss my parents off. I really like it when they really like our stuff. I can cope with it when they think it's a bit weird. Their record collection is totally what we started with and they are of that age where they were the right age for The Beatles, they were the right age for The Stones, they were the right age for that sophisticated adult pop of the early '80s, the Peter Gabriels, the Kate Bushes, they had those records. They had some of the less-good mid-'70s Rolling Stones albums as well, best of the Bob Dylan, best of Sly & The Family Stone, I remember. Also some stuff where I'd listen back now and think "Nah, this was never very good," but I still have a fondness for it. Like, the first Wet Wet Wet album. What's the most difficult thing, if there is one, about being in a band with your brother? We just spend an awful lot of time together. One of the reasons we've occasionally taken breaks and switched things around and done solo records or other projects, once we've spent five months in the studio and then two months rehearsing the band and eight months touring on and off, in the same bedroom, same hotel room, in the same van. We just need a bit of a break. We especially need a break from making decisions together. I don't really know what it's like to be in a band with other people. I've pretty much only done bands with Peter. But that thing of the two of us being in charge and the two of us having to make decisions together, after a while can get quite fraught. That's why sometimes good for us to take those little breaks. It's not like we take a break from seeing each other and playing together, but we take a break from being in charge together, so whenever we've done solo records, we still tour with each other and play on the records, maybe, but we know that one person is in charge and we don't have to sit around and talk about whether we both like the art, whether we both agree on the track listing or how we want this set list to be or how we want to arrange a particular song for live. Doing all of those things together after we've spent five months cooped up in the studio is hard. So the solo records are a break from that. We can just say, "You do whatever you like and you tell me what to do and I'll help." I think that's a healthy approach, a lot of people point to the collapse of The Beatles being when Brian Epstein passed away and they had to make more monetary decisions, that seems to be what really tore them down. Through the whole of pop history and even now, it's seen as a strange thing to say, "Let's just take two or three years off and then we'll see if we want to do a record together again. Because I don't hate you, but I'm kind of sick of you now." That's seen as being something quite dramatic to do. And for a lot of bands it's financially very difficult because you're expected to maintain a certain commercial level. I can tell you with a certain degree of knowledge of this that side projects do not have the same degree of commercial certainty. Imagine that in June 1967, you've made these great records, Paul has got loads of ideas, John's not interested, should we just take a break and do something else for a couple of year? And then before we get in a mess and decide that we hate each other, take some time off and maybe we'll come back to this, maybe we'll decide we don't need to. For us, we're kind of lucky that what came out that is that they still made the White Album they still made Abbey Road under those conditions. They were kids, they were much younger than me when all that happened. I've got a lot of sympathy for James Murphy at the moment. He said, "I'm kind of sick of doing this, I've had enough. The band's finished." Then a couple years later thinks, "I've had enough time off, I want to do LCD again." That's fine, I certainly don't agree with anyone criticizing him for accidentally not splitting the band up. "It turns out I didn't hate you all and I'd like to do another LCD Soundsystem album, is that okay?" It sounds fine, they should have just taken a break, it's okay. I do think it seems to help bands to take some time off. Going back to The Beatles, like in 1966 when they took some time off when John was filming How I Won The War, Ringo was just kind of hanging out. I think it was healthy because John came back with "Strawberry Fields Forever" and they kind of went into Sgt. Pepper-mode. I do think a band hiatus is healthy. I remember reading that a member of The Walkmen said he regretted calling their hiatus an extreme hiatus because they might feel like getting together again sometime. How can you know how you're going to feel about those things in like a year or two year's time? When we took a break after our second album in 2007, I didn't think we'd do another record, I thought that was it. But you know a year or two doing other things and you start to think, "Yeah, I'd just like to be playing with Peter, that's fine. We should do another album together and with a little bit more wisdom this time." Extreme hiatus, that's a good one. I know that you and your brother have a number of side projects, how do you know when a song is a better fit for one of those versus being fit for Field Music? It tends to be what feels right at the time. Doing the kind of solo projects always allows us to follow through a concept more completely than when we're trying to do it together. If in a few months I find myself with ten songs, but everyone sounds like it should be on a Luther Vandross album, it makes more sense for that to be a School of Language record. Or if nine songs sound like a Luther Vandross record and there's one leftover, then maybe that one that sounds like Todd Rundgren can go on the next Field Music album. But it's pretty fluid. All of the solo records and other projects that we've done have always informed what we do next with Field Music. It never feels like one thing opposes the other. That's one reason we tend to put Field Music production on it. It feels like a continuation of what we're doing anyway but not quite the same band. It feels kind of linear, each thing has led to another. 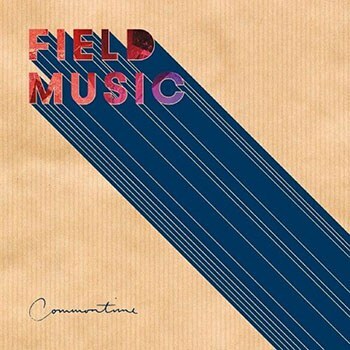 So now there are songs on this Field Music record which, if I'd had this idea in 2007, wouldn't have felt like they could be on a Field Music record. I don't write enough to be all that fussy about where they go, actually. I'd love to have loads of spares. Like Ryan Adams would write 30 songs a day. Ten songs a year is probably the best I'm ever going to get. You try and find what the point is in what he did, like now, you listen to Station to Station and you can hear what was gonna happen maybe in Low and you can hear the traces that came from Young Americans but if you don't have all the records, you don't know. So you'll just have to but them all! [laughs] I'm going to do an advert like that "You've just got to buy them all. Otherwise you won't know." I just have one last question for you, David: what are your professional/personal goals/hope for 2016? I want to do some great gigs where I get to then and I just think "We were really good! I could see people smiling in the audience and clapping along and singing along, even." That would be nice. It would be great if enough people bought this record for us to make another one. If across this summer, when we really only have festival shows if we could still get into the studio and make some new music, that would be good. On a personal level, I would really, really, like it if the house move that has taken four months until now, would finally, actually happen. All of my records are boxed away, because I thought we were going to move before Christmas and we haven't We still haven't moved. I'd really like to get that frustration out of the way. [sighs] I just thought about it again and got stressed. I feel like I have modest goals.